Welcome to the sixth part in our summer series introducing some of the top players in the 2015 recruiting class. Last week, we caught up with Richmond (Va.) St. Christopher's School cornerback Garrett Taylor, who is one of the top defensive backs in his class. This week, we're taking a trip to the deep south, as we talk to Orangeburg-Wilkinson (S.C.) defensive end/defensive tackle Albert Huggins. 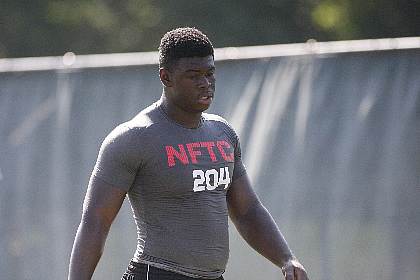 Overall, he is 28th and holds five-star status in the 24/7 Sports 2015 composite rankings. 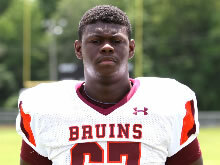 The massive, 6-foot-3-inch, 280 pound defensive linemen holds offers from Alabama, Auburn, Clemson, Florida, Florida State, Georgia, Louisville, Michigan State, North Carolina, North Carolina State, South Carolina State, South Carolina, and Tennessee. He is also receiving a fair amount of interest from Ohio State. So far, Huggins has had the chance to visit a couple of schools and both of his visits went well. "I went to [South Carolina] Black Magic two weeks ago. I really enjoyed myself," Huggins told Eleven Warriors. "I got to work with Coach [Deke] Adams a lot, because there were only a few defensive ends at the camp." The junior standout – who also visited Clemson – isn't rushing his recruiting process. "I'm just laid back right now, getting information on all these schools," he said. "I'm starting to get to know these schools pretty well. Other than that, I'm just taking things slow." While the Buckeyes have yet to offer the five star talent, they have expressed some interest. "I've had some conversations with their recruiting director [Mark Pantoni] – he just tells me all about the school," Huggins told Eleven Warriors. "I've heard all about the football program. The facilities, academics and everything." He is a bit surprised the Bucks have yet to extend him a scholarship offer. "I thought they were going to offer me, but they haven't really talked too much about an offer," he said. "I just get information about the school and they want me to come visit at some point in the next year or so." An offer from the Scarlet and Gray would definitely open Huggins' eyes. "I have 12-13 offers right now. Every one of them is a blessing," he said. "That offer would be a great feeling. I would definitely be interested." Huggins has expressed a high amount of interest in Alabama. "It's a blessing to be recruited by Alabama. I talk to Coach [Chris] Rumph a lot. I have a great relationship with him," he said. "I've really connected with their staff. It's just a great feeling knowing I have the opportunity to play for them if I would like to." He is fond of Alabama's opponent in last year's SEC Championship Game, as well – the Georgia Bulldogs. "Georgia was kind of my team growing up," Huggins told Eleven Warriors. "They run a 3-4 and I prefer a 4-3, but I'm still definitely interested. They're just a good team overall." Meanwhile, his connection to the Gamecocks' staff keeps him interested in a place he already visited. "I know the South Carolina coaches really well and I know a lot of guys already committed to play there," he said. "It's a great feeling to be in touch with them. Coach [Steve] Spurrier is a great coach and the atmosphere there is great." As things currently stand, he doesn't have a leader nor a timetable for his college decision. "I'm treating every school as an equal as I try to learn more about the schools recruiting me," Huggins said. "I'm not sure when I'll make my decision. Just whenever it hits me." Education and a couple of other factors will weigh heavily on his decision. "First comes education. That's definitely the most important thing," he said. "Then comes my relationships with the coaching staff, location of the school, and finally the campus environment." Huggins would like to take visits to Alabama, Auburn, Florida, and Georgia this fall. The Buckeyes could receive a visit if they extend him an offer. Right now, the Orangeburg-Wilkinson star is focused on his school's upcoming football season, which is drawing closer and closer with every passing day. "My main goal this year is to win a championship. That's the most important thing," Huggins said. "I would also like to grow closer to my teammates and become a better leader. Individually, I would like to make 90 or more tackles."